I'm getting really sick of winter. 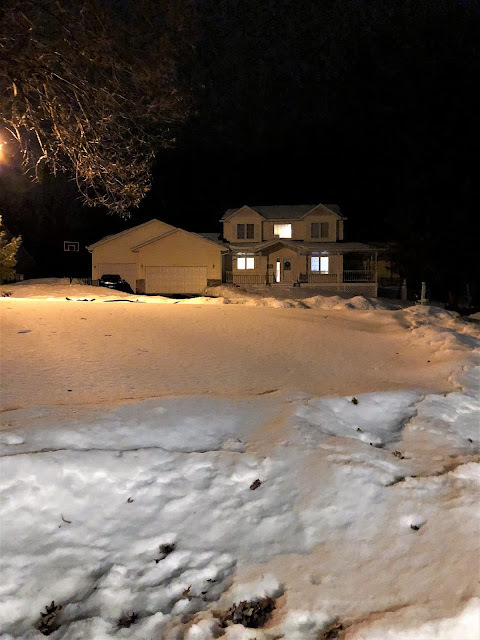 When we walked out of our neighbor's house the other night, I took this picture of my house because I thought it looked like it was sitting on a mountain of snow. Technically we're at the top of a hill, but I thought from this perspective it looked like a hill of snow. What do I know? Monday gave us another 7 inches of the white stuff. It also brought down one of our neighbor's trees into our yard. They were very nice, though, and took a chain saw to it and hauled it away for us. Such good neighbors. Luke and Avery were home from college this weekend for Spring Break. Avery also brought home his girlfriend, Emma. They were reminiscing about how much fun they used to have building snow forts and one thing led to another. They now have a big snow fort in the front yard. They know how to have a crazy time on a Saturday night! Luke spends a lot of time bowling when he's at college so we thought it would be fun to get in a game while he was home. It was. On Friday, my buddies from Iowa came to town for a boy's weekend. It was really good to see them. The weekend started at Shooter's Billiards in Burnsville where we played a bunch of pool. On Saturday morning, we headed over to the Mall of America because that seems like an appropriate thing to do on a Guy's weekend. We were excited to be there because the stars of the upcoming movie Midnight Sun were there to make an appearance. Patrick Schwarzenegger is the son of Arnold and Bella Thorne is a former Disney star. Both of them seemed to be pretty excited to be at the Mall of America. Just like I was. We stopped at Bubba Gump Shrimp factory to eat some seafood and watch Forrest Gump silently on the screen in front of us. Don't tell us we don't know how to party. Later that night, we came back to the Mall to go to Benihana. Our boy's weekends used to be quite a bit crazier. Now they seem to be focused around food a lot of the time. In any case, I had a bunch of fun with my old buddies. On Sunday, we met Grandma Linda for lunch. I'd like to think that she looks as small as she does because it's a trick of photography because she's sitting at the far end of the table. But no, it's not a camera trick. She really is that small.